The book I made for the swap is a hardcover pamphlet structure with a dark green suede leather spine. I marbled the paper used on the covers. That is one of the first marbled papers I ever made, actually. The textblock is a single section of about 50 pages. I've used a wide variety of papers for the text block. 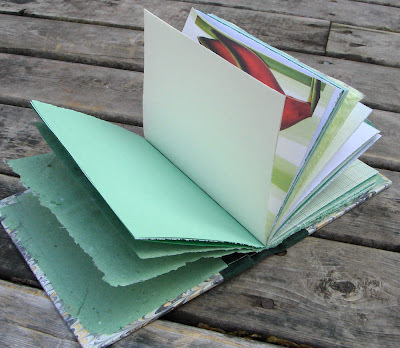 The paper that is used on the inside of the covers and for the first couple pages is some handmade paper that I made by recycling my green paper scraps. The rest of the papers are a mix of plain, lined, decorative, and other handmade papers. Check out my shop at MyHandboundBooks.Etsy.com. A lovely book in my favourite colour--perfect post for today! Book looks great and love the marbled papers. Those look wonderful for a first try at marbling! Beautiful job creating the marbled paper. I am envious of your marbling skills. I have never tried doing it before - it looks complicated. 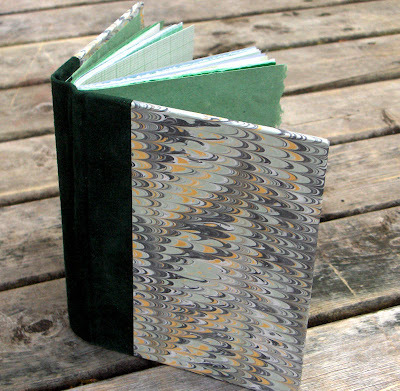 Amazing, that's much more than a handbound book, with handmarbled cover and handmade papers! The book has reached me yesterday - thanks Rhonda! Holding it in hands I like it even better: The spine is surprisingly soft and nice to touch and the assortment of papers is fun, too. I am going to use it as a notebook.